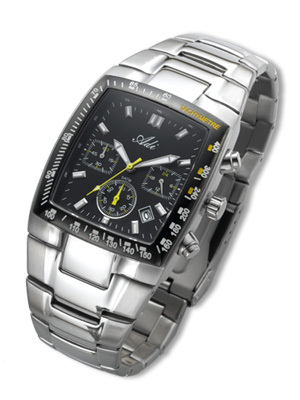 Elegant men's sporty chronograph watch, stainless steel with black dial, designer stainless steel bracelet, chronograph quartz movement, stopper with dates, water-resistant to 50 m.The factory of Adi watches was established in Yavne in 1984 and they are the only watches factory in Israel. Adi Factory have a rich variety of models, including some 200 watches for men, women, youth and children. Diving Watches, Sports watches, Elegant watches, classical Watches and much more. some of the watches made from Mfldt Titnium rustproof. Each watch is packed in an elegant silver colored gift box.